Identity and Chinese culture are subjects about which I am immensely passionate, as indeed were most of the participants in the discussion. I can really only write about my personal experience, though, I do hope to give it a little historical context. China has existed in bouts of unification and disruption. History surrounding the Warring States period (BC771-256), the period of North and South dispute, and of course the Three Kingdom period (BC206 to AD220) is very popular within China and constantly dramatised. Add to that the later invasion and incorporation of the Liao, Mongols and the Manchu. The idea of what China is had always been one of constant flux, with its latest incarnation as the PRC, seeming a relatively new kid on the block, at a spritely sixty something years. My own story, and the formation of my identity starts in the 1980s and 90s, and whilst it will seem strange to many, it will be far too familiar to some. I was born in the southern city of Guangzhou, to a mother native to Changchun, a city in China’s far north, and a father who was Teochew by blood, but grew up in Beijing. Though he can understand Teochew (a southern dialect), he identifies far more with the ways of the north, from language to culture. A unified cultural identity was never going to be my birthright. As a toddler I was raised by community friends in Guangzhou, away from my Mandarin speaking parents, and it was only on a longer soujurn from their busy work lives that they discovered they could not communicate with their now Cantonese-speaking daughter. They promptly sent me up north for numerous summers to learn some proper Mandarin. Our social circle and the kids at primary school reminded me at every opportunity that my physique, habits, tastes and outlook were very different from theirs. In the north, I was dismissed as a precocious brat showing off my cool Cantonese clothes. In the south, I was a backward northerner with rustic tastes. My maternal family had heavy and varying accents, which I sometimes found hard to understand, my grandfather being from Hubei in central China and my grandmother from Shenyang. Whilst some could (and did) argue, that having such a varied set of influences opened up all of China to me, it did so at the cost of really feeling like I belonged somewhere. The only place I really felt I belonged was in Guangzhou, where my parents had chosen to settle, but never really shared my closeness to indigenous Cantonese culture. My sense of not fitting in was triggered again when I came to the UK. Arriving at the age of 11, China was firmly rooted in my being, but I was still very young and Britain, with its rich seams of literature, history and humour, left a deep impression. I feel very comfortable here, and am as happy to call it my home as I am China, and was very proud to receive my British passport in 1997. As an adult, people who know me well often remark how different they find my approach, experiences and cultural reference points. People who don’t know me well assume that I’m British-born Chinese. Those who, to put it politely, find other cultures daunting, found me disconcerting, far too au fait with Ealing Comedies and Wilkie Collins, but not Eastenders or the Wombles. In China, strangers assume I’m native Chinese, but once they’ve been told my background, see me as a totally westernized “hua qiao”, and feel the need to explain everything from the tube system to chopsticks to me. I have to steer a very straight path between politeness and defensiveness. I feel very connected to China, its culture and history. Hearing it attacked, even with the best of intentions, always leaves me burning slightly with indignation. It has taken me decades become comfortable with what I am. An individual who culturally intersect many places. Whether British or Chinese, northern or southern, I am myself. No matter where my parents came from, I was born and raised in Guangzhou and its indigenous culture is part of me. Even though I’d still be seen as an outsider pretty much anywhere, I quite firmly identify with being Cantonese, Chinese and British (although I am very sad to say my sense of belonging in Britain has been shaken by the events of the last year or so.) People do still question where my heart lies. My partner’s elderly grandmother would often ask what language I dreamt in, or if I felt more homesick in China or England. The truth is I feel homesick everywhere, but not for anywhere. During my time at university, it struck me how much my life has been a Chinese to English translation. Not just language, but culture, ideas and outlook. It was only when I started translating literature that I really began to see how much misunderstanding and misrepresentation there has been of China and its culture for decades, even in works that had been round for hundreds of years. There was not much about contemporary China that wasn’t pity-lit factory girl stories, or comic jibes at cheap Chinese knock-offs. So I started my work as a writer and speaker, to promote Chinese culture. I not only looked at classic literature, tea, or the usual suspects, but also produced work focusing on pop culture and its roots in traditional China, showing people a cool China that is changing very fast, and also helping westerners understand why China is the way it is, from both its history, and the very real pressures it faces. And yes, I am promoting Chinese culture as a whole, from the culturally Chinese diaspora around the world, to the culture of China’s wide internal variations. Because of the diversity of my own background, I have always been interested in the myriad of cultures other than Han within China, even choosing to take my post-graduate studies at China’s Central University of Nationalities, rather than the “go-to” institutions for overseas students. There, as well as Han literature, I was able to learn about minority folklore, study and lunch with Hakka teenagers, discuss religion with Uighur friends. Outside my classes, two of my cousins have Hui and Meng Gu fathers. Whilst all of these individuals respect their heritage, it was not necesarily what defined them. I have met Yi minority metal bands, Manchu goths, and like most people in China I’ve eaten delicious skewers of roast lamb and donkey buns from Uighur street stalls. If you talk to these people, they will say they are Chinese long before telling you their ethnicity. This is not so much a political identity as a cultural one. Yes, apart from the cultures and customs of each region, the value of which China has realised and come to support in the last couple of decades, there is a cultural identity of China as a whole that the Chinese in the mainland identify with. Hokkien, Hakka and Teochew are not the only dialects and regional languages, they are just the ones that have global eyes on them, being the first ones most Westerners are likely to bump into. 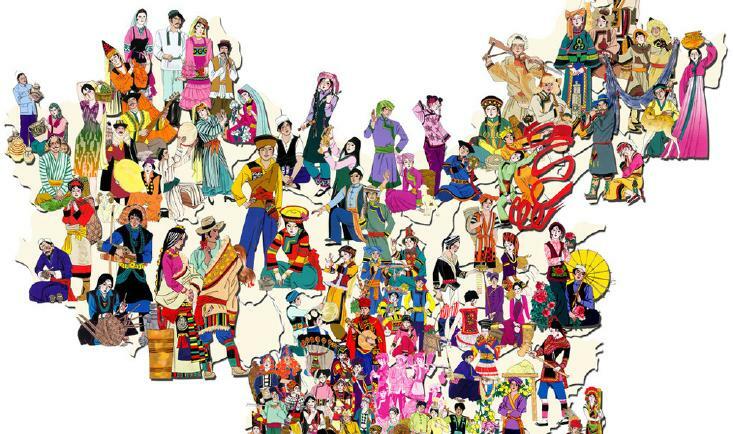 With 23 provinces, 5 autonomous regions and 2 special administrative regions, each of which has dozens of dialects and topolects, there is a huge amount of diversity even within the Han ethnic group. Even though they are taught Mandarin at school, Chinese people communicate, transact, everyday, in their local tongues, with emoji and adapted script standing in for those “Fang Yan” not wholly represented in written Chinese. China can be dissected. If we went back far enough, we could even question the authenticity of the last 300 years of imperial history as Chinese. Like other nations with long histories, such as Britain, whose rich culture is derived from those people who have come to call the island home, the Chinese are an amalgam of ethnicities. Diversity does not have to mean division, but enrichment, when treated with tolerance and understanding.